There’s something particularly charming about the size and strategy of the books in the BFI Modern Classics series. Their compact nature and the specificity of their scope mean that I can live comfortably in them in all kinds of contexts and absorb myself. One author engaging with one film – a film that is always evidently close to them in assorted and significantly distinctive ways – generates a sense of companionship between text and reader. The series allows the personal attentions of the author to be not so much foregrounded as present. This gets us up-close and personal, not only with a particular film, but also with the means of engagement with it. The introduction to Lalitha Gopalan’s BFI Modern Classic on Bombay (1995), directed by Mani Ratnam, opens with discussion of Elia Suleiman’s Divine Intervention (Yadon ilaheyya, 2002) where, to Gopalan’s surprise, the theme music from Bombay is heard at an approaching Israeli checkpoint. Gopalan’s analysis of Bombay is thus positioned within international debates on the narration of national traumas, via a personal moment of shock from the author’s own archive of film-going experiences. Gopalan rightly suggests that, with ten years of reflection since the film’s release, her response to the film here can productively re-inflect the frames of reference. This is not to say that the book does not delve deeply into the furore that erupted around Bombay’s release in India. The fact that Gopalan spends the first chapter considering Bombay in the context of its reception in India is essential. This is the second book in the BFI Modern Classics series to address Indian cinema, after the publication in 2002 of Anupama Chopra’s account of Dilwale Dulhania Le Jayenge (The Brave-hearted Will Take the Bride, Aditya Chopra, 1995). I, for one, am very thankful that we have reached number two. It is a pleasure to be able to access these detailed reports of the complex local debates this film provoked. Gopalan’s first chapter forages extensively into these debates that took place in an array of printed forms. She has not simply worked through Bombay’s reception but essentially delved into the piles of paper that preceded and followed the film’s release. In addition to industriously uncovering a range of documents, including bureaucratic and government papers as well as a range of responses in the press, Gopalan brings together several eye-witness, on-set accounts via interviews with many of the film’s creators. These yarns and legends blend with those surrounding the real-life events that inspired the film: the communal riots that shocked the city of Bombay after Hindu fundamentalists dismantled the historic Babri Masjid mosque. The impact of censorship on the film holds a central place throughout this early discussion and the later chapters. Turn to the appendix of Gopalan’s Bombay and you will find a copy of the original Central Board of Film Certification report on the film. It contains detailed instructions for cuts that must be made, revealing that whole scenes were deleted, as well as ongoing references to specific words or events. This report plainly exposes the political biases of the censor and the newly elected state government of the day – the right-wing Hindu nationalist party, the Shiva Sena – in relation to this communal conflict. We discover that all references to Pakistan were deleted, as well as all the shots of the Babri Masjid mosque being pulled down and any images of policemen shooting innocent bystanders during fight scenes. Providing access to this document, which holds a key place in Gopalan’s discussions, is a powerful move. Firstly, it helps us begin to grasp the vast amount of work Gopalan has done to illuminate this report for us in the first chapter. Secondly, the opportunity to read the Board’s recommendations in full means we can develop our own responses to their decisions. And, perhaps most importantly, it gives us the opportunity to piece together in our own heads a sense of the shape of the original, never-seen version of the film. This document truly brings home the point that Bombay cannot be considered simply as a whole, undisturbed work of superstar director Mani Ratnam’s unwavering vision. Gopalan’s own approach to the film continually attempts to respond to this fact. Her writing serves to emphasise that the film bears the traces of the censor’s cuts. In the second chapter, having exhausted the ins and outs of the film’s creation and initial reception, Gopalan brings Bombay into full and vigorous dialogue with a range of international film practices and critical work. She draws upon everything from films dealing with unresolved traumatic national events that involve aspects of the horror genre (1), to Shohini Chaudhuri and Howard Finn’s discussion of the “open image” at work in many new Iranian films (2). In fact, discussion of the “open image” is initially evoked by Gopalan’s own inability to shake off the memory, after her first viewing of Bombay, of an empty landscape by the riverbank, held for a few frames. This kind of approach to the inclusion of theoretical material reflects a self-assured and exuberant critical energy at play. It is this kind of critical exuberance that is also at work in Gopalan’s Cinema of Interruptions: Action Genres in Contemporary Indian Cinema, which I reviewed in issue 28 of Senses of Cinema. In many ways, we could envisage this move towards combining selections from the whole of Gopalan’s personal film-viewing and reading archive as a departure from the approach of the first chapter. Emerging from the tight weave of accounts that brings Bombay to life in the first chapter, it is as if much larger collisions can start to take place in the second. Certainly, the first and the second chapters attack the film from different angles, so that something is generated between them. However, while the discussion in the second chapter does appear to soar high in order to draw things from far-flung places, it is less of a departure from the first chapter’s anchored attention to the film’s more immediate surroundings than might first appear to be the case. The anchor in both chapters is, of course, Gopalan, as the theoretical manoeuvring of the second chapter reminds us. The second chapter not only brings Gopalan’s own experiences to the fore; like the first chapter, it also responds to the specific approach of the film itself. Bombay was an attempt to generate an experience of the chaos, the intense conflict, and the competing accounts of the real events that took place in the city of Bombay. The film was designed to bear witness to the cacophony and conflict of the events that surrounded the riot. But interestingly, as Gopalan illuminates for us, there was also cacophony and conflict surrounding the film’s reception. This cacophony did not stop with the interventions of the censor and leading political figures. Gopalan provides reports of the film’s early reception, including a hoax bomb threat, riots in suburban cinemas and numerous calls for the film to be banned. Internationally, the film made waves on the festival circuit, screening at more than twenty international film festivals including Cannes, and won awards at the Edinburgh Film Festival and the Jerusalem International Film Festival, in addition to a range of awards on the national stage. By colliding together a whole range of ideas and experiences, the style of the second chapter reflects the local cacophony surrounding the film as well as its successful international circulation. Gopalan’s final, brief chapter imprints an afterimage. After the meticulous work of the previous two chapters, the third lasts not much longer than the final freeze-frame it serves to illuminate. Critical discussion, however, continues to move quickly. In less than a page and a half, we travel between an interview with Mani Ratnam and an aside about the nature of cinema audiences in India, before heading into a personal acknowledgement of the nature of a close reading’s ability to reanimate a work. We nod to the affiliation Gopalan has forged between Bombay and the horror genre, aligned with her discussion of the film’s place in global cinematic attempts to render traumatic events, and arrive at an uncanny persistence. Gopalan notes that Bombay closes with a freeze-frame of two images: a close-up of two hands joined together as if shaking on an agreement and a shot of the family in the film – a Muslim mother, a Hindu father and two sons – huddled together against the backdrop of a ruined city. In response to Gopalan’s inquiry, Ratnam insisted that the first image should have closed the film; in fact, he claimed that the first image did actually end the film, until he double-checked the print on the editing table after their interview. In closing, Gopalan gestures that the film outfoxed authorial intent in the apparent compression of these two images that Ratnam unwittingly allowed to meet with the film’s credits. In doing so, Gopalan traces her own critical journey in her final manoeuvre by exposing Bombay to yet another rupture. At the same time, this closing move opens the film to new possibilities for engagement. It moved me as a reader out of the book and into the prospect of continuing to think with the ruptures rendered to and by Bombay. 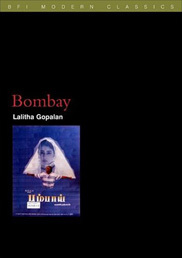 Bombay, by Lalitha Gopalan, BFI Modern Classics, BFI Publishing, London, 2005. Gopalan identifies this as a subgenre of the horror film and traces its roots to the films of Georges Franju and Alain Resnais. Shohini Chaudhuri and Howard Finn, “The Open Image: Poetic Realism and the New Iranian Cinema”, Screen, vol. 44, no. 1, Spring, 2003, pp. 38-57.